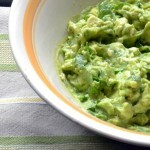 The easiest and best guacamole recipe out there. Cut each avocado in half and remove pit. Score the insides lengthwise and crosswise. Scoop out the insides and place in a large bowl. Mash with fork until the consistency you prefer. I like it to be a bit chunky, rather than smooth. Top with cojita cheese (optional).